Now that I have some time to breath I thought I’d say some things about my wonderful friend and colleague, Sara Jo (Zweena bint Asya), who will be moving back to Oregon in a couple of weeks. Fort Wayne will be losing a wonderful talent. As a member of il Troubadore I first met Sara Jo last December. 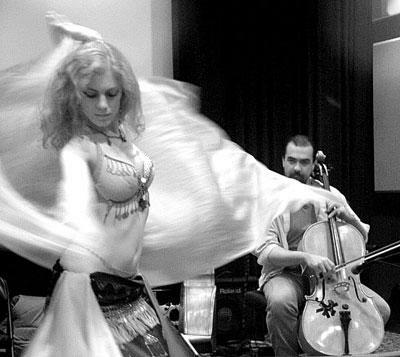 She somehow heard that il Troubadore performed Middle-Eastern influenced music and she contacted Robert to see if she and her troupe could dance with us. Sara Jo, who has studied with master dancers throughout the US and Morocco, has founded two belly-dance troupes (Troupe Scheherazade in Boston and Troupe Taleeba in Fort Wayne, IN) and has done choreography for and has performed as principal dancer for the Lyric Opera of Chicago. With degrees from Wellesley and Harvard, Sara Jo is an active educator and instructor in Middle Eastern culture and many styles of dance. Last night she and Troupe Taleeba again danced to il Troubadore‘s original belly-dance music to a relatively small but enthusiastic crowd. Though this may be the last time we work with her in Fort Wayne il Troubadore are planning to bring her back to Indianapolis in the future to perform with us. Good luck and keep on shimmying, Sara Jo! More photos from and info about the show may be found here.